A cellular polyester blue foam that has uniform air pockets throughout the pad for optimal fluid flow. It prevents either small or fragmented tissue specimens from being lost. To Use: Place small samples or specimen fragments between the two pads and place the specimen in a cassette or capsule. SureSeal™ Bags are gamma sterilized, leaving a virgin interior surface with no toxic residue from gas exposure. Samples can easily be collected by removing the tear strip above the wire closure and pulling on the two external grip tabs to open the mouth of the bag to the desired level. Using the grip tabs ensures sterility and eliminates the risk of contamination from finger contact. Then, introduce the sample into the bag, flip or fold the bag three times, bend the wires and your sample is secure inside the airtight and moisture-sealed bag. SureSeal™ bags are made of virgin polyethylene for excellent clarity and stregth. They meet USDA, EPA and FDA standards and are sterile, RNase-free, DNase-free and non-pyrogenic. The PVC tab that surrounds the stainless steel wire is extended beyond the wire ends to eliminate the potential for punctures, scratched hands or ripped gloves due to exposure to uncovered wire ends. 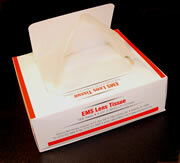 Several sizes are supplied with a white printed area that eliminates tapes, labels, etc. and makes markings more longlasting, clearly visible and less prone to smearing. Although these bags can contain up to 55oz. (1600 ml), they fold completely flat and require very little storage space. These bags are made from porous paper which provides maximum tissue safety during processing. They permit proper fluid exchange and drainage. Available in three sizes. 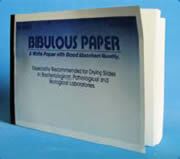 To Use: Simply introduce the specimen into the bag and fold it enclosing the cassette or capsule. You are now ready to process as usual. Proven Technology. Superior Reliability. Protecting Every Life Story In Your Lab. Specifically designed for processing biopsy specimens. Non-absorbent mesh allows fluids to flow through freely while containing small tissue fragments. Cotton woven cloth in the pattern of 44x36 (44 lines/inch horizontally and 36 lines/inch vertically) which makes it suitable for cleaning and polishing. Supplied in 60 yard rolls (continuous) 36" in width; This configuration allows you to cut out the exact length you desire. A large size towel (13.3" x 23") suitable for many uses around the lab. High absorbency and strong, even when wet.